Is the 10g Airmail and postcard rate remaining on the new tariff ? - YES!! Breaking News - the 10g airmail (International Standard) rate may not be disappearing on Sunday! As I write there is uncertainty over what is happening to Airmail rates on Monday. According to the first downloaded rate chart, and the leaflet in Post Office branches, there will be no 10g rate from Monday 31 March. But I have been told about a new download chart which shows that the 10g rate of 97p applying to both Europe and the rest of the world - which will please Postcrossers. There may also be implications for Post and Go machines. For an up-to-date statement on what is happening on Post and Go machines from Monday 31st please see the Tariff-change blogpost. I'm seeking clarification from Royal Mail ! Royal Mail have confirmed that the rate for postcards and 10g letters worldwide will be 97p replacing the 88p current rate. Download the changed Postage Rates leaflet from Royal Mail's website (pdf). But will a 10g Post & Go stamp be available? I've asked Royal Mail about many matters regarding the tariff change, and I'm awaiting answers. 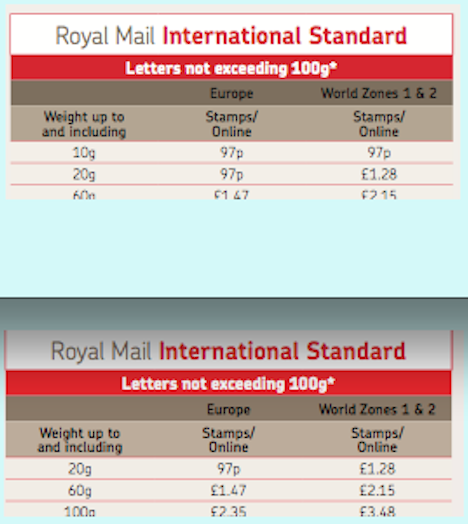 Royal Mail have still not confirmed what a 'Worldwide up to 40g' stamp will be worth or what it can be used for after the tariff increase on Monday. Although some information and suggestions have been given by readers of your blog, nothing has been confirmed! Royal mail are not giving their customers much information at all! In the short term a notice will tell customers to buy a Europe 20g for postcards/World 10; the machines will later revert to producing World 10g from the 'post an item' menu. Let’s not forget the Airmail NVI booklet stamps which will also have the same issue. Likely hood they will be valid for payment or part payment up to the value when the weight step was discontinued ie £1.88, unless RM decide to invalidate them in the near future as some postal authorities have done with their NVI stamps. Heard it said that strip of six will change as publicised, though 10g worldwide will still be dispensed via post an item on Wincor machines, so seven values a possibility. Time will tell what actually happens, as the machines are Post Office equipment, maybe one for the Post Office rather than RM to answer. The only certainty in all this is Monday is going to be expensive. At least the NCR offices have are only being supplied with Machin stock. Latest official report is that 10g Post & Go stamps will be withdrawn on Tuesday am. Worldwide unto '60g' will also be issued. Where is this 'latest official report' from - email me privately if you wish! We've said for a couple of weeks that Worldwide 10g and Worldwide 40g would be replaced by Europe and Worldwide 60g. 60g will be available Trafalgar Sq. on Monday pm and nationally from Tuesday am. Oh, that should make Monday interesting when hundreds of collectors go to their local machines to buy new stamps. Must take this up officially. I have made enquiries and the correct information is now as posted on the blog post. I think the up to 10g label stamp will be replaced by an up to 20g one? The question which RM have not yet answered AFAIK is whether the 10g and 40g labels already issued but unused will be valid for postage and at what rate. Clearly they are not going to answer this on a public forum until after 31 March - otherwise people will go out and stock up and they will lose money. If I were RM I certainly wouldn't confirm it until after the tariff increase date!